(CNN) -- Manchester United have signed Senegal striker Mame Biram Diouf, less than a week after manager Alex Ferguson said their spending in the close season transfer window was at an end. Ferguson announces their latest acquisition at a press conference in Kuala Lumpur. The 21-year-old will have a medical in Manchester next week and is set to join the English Premier League champions in January, the club's official Web site www.manutd.com reported. Diouf is likely to remain on loan at the Norwegian club until then. 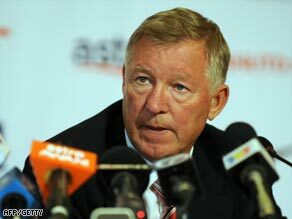 Ferguson told a press conference in Kuala Lumpur where United are on tour that Diouf had been a target for some time. "We've been looking at him for two years," he said. "We weren't intending on signing anyone else after last week -- we feel we have a full squad -- but the situation accelerated to a point where other clubs started to make bids, so we had a decision to make. "We decided to act now and he'll be the last person we sign this summer." Diouf has scored 38 times in 73 appearances for Molde, the same club from which United signed striking star Ole Gunnar Solskjaer as a virtual unknown in 1996. Ferguson claimed that he had concluded his summer transfer spending last week as he unveiled Antonio Valencia, Gabriel Obertan and Michael Owen. His comments took observers by surprise, particularly as United had netted $130 million for the sale of Cristiano Ronaldo to Real Madrid. Feature: Prudence rules the Premier League. But Ferguson claimed that it was "difficult to get value" with transfer fees rocketing sky-high as Real and Manchester City have splashed out millions to strengthen their squads. In other transfer news on Friday, United confirmed that they had agreed terms with Real Valladolid for the transfer of their Angolan striker Manucho. The 26-year-old has failed to win a regular first team place and has spent spells on loan with Greek side Panathinaikos and with English Premier League Hull City.